Delos Artist Lawrence Brownlee Gets Grammy Nomination! | Virtuoso Rossini Arias | Delos Music | Outstanding Classical Recordings for over 40 Years! Delos Artist Lawrence Brownlee Gets Grammy Nomination! 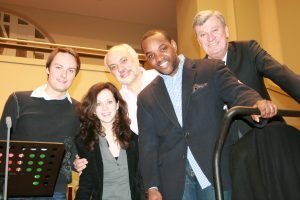 When the 57th annual GRAMMY Award nominees were announced last Friday (Dec. 5), we at Delos were overjoyed (though hardly surprised) to learn that bel canto tenor Lawrence Brownlee’s spectacular Virtuoso Rossini Arias (DE 3455) had been nominated in the Best Classical Solo Vocal Album category! Brownlee’s breathtaking album is the international superstar’s first-ever recording with orchestra, with the honors going to maestro Constantine Orbelian, “…the singer’s dream collaborator” (Opera News) conducting the Kaunas City Symphony Orchestra (Lithuania). The great news came hard on the heels of last month’s announcement that the very same album (along with two other Delos releases) had been nominated for final consideration in Europe’s prestigious International Classical Music Awards (ICMA) competition. This stellar release is thus getting well-deserved attention on BOTH sides of the pond! Given the flood of ecstatic rave reviews the CD has gotten since its release – many of which have been featured in these website pages – the Delos team’s hopes for a GRAMMY nomination were well and truly justified. It’ll be hard not to hold our collective breath until the upcoming awards telecast that’ll happen on Sunday, February 8, 2015! Buy Virtuoso Rossini Arias Today!